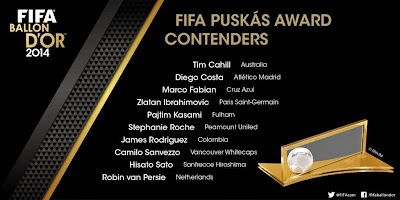 FIFA have announced the top ten goals which are nominated for the FIFA Puskás Award 2014. The Goals are from World Cup, Premier League, La Liga, MLS, etc. FIFA have added all the goals on their official YouTube channel. The big surprise is that Cristiano Ronaldo, Lionel Messi, Gareth Bale, Neymar and Luis Suarez all failed to be a part of this nominations. Tim Cahill scored a wonderful goal against Netherlands in the World Cup while representing his country Australia on 18th June, 2014. Spanish striker Diego Costa scored against Getafe in a Primera División (Spain) game between Atlético Madrid and Getafe on 23rd November, 2013. Cruz Azul midfielder Marco Fabian scored against Puebla in 1a División 2014 Clausura (Mexico) on 15th February, 2014. Paris Saints Germain striker Zlatan Ibrahimovic scored against SC Bastia in a Ligue 1 (France) game on 19th October, 2013. Pajtim Kasami scored for Fulham against Crystal Palace in a Premier League (England) fixture on 21st October, 2013. Peamount United player Stephanie Roche scored in a BEWNL (Rep.Ireland) game against Wexford Youths on 20th October, 2013. Colombian attacker James Rodriguez scored a wonderful volley against Uruguay in the World Cup on 28th June, 2014. Vancouver Whitecaps forward Camilo Sanvezzo scored against Portland Timbers in a Major Soccer League (USA/Canada) game on 6th October, 2013. Sanfrecce Hiroshima forward Hisato Sato scored in the Japanaese League (Japan) against Kawasaki Frontale on 8th March 2014. Netherlands striker Robin van Persie scored a exceptional diving header against Spain in the World Cup group clash on 13th June, 2014.
too difficult to make a top, James for me! the only female and i think what a goal!